Thank you for using the BZ-100 Bluetooth® Wireless Stereo Headphones. We hope you enjoy them! The headset is not waterproof. Keep water or moisture away from Headphones. Use the charging cord USB adaptor only with a computer’s USB port to charge it. Maximize battery life by charging the headphones once a week. To connect to Bluetooth mode, press EQ inward and look for light blue indicator that alternates with green color. Wait a few moments for the headphones to be in Bluetooth mode. On a phone, turn on its Bluetooth service and scan for paired devices. Look for listing that says “BZ-100”. Click on the BZ-100 to connect. The headset indicator will blink light green when it connects successfully. Note: On some phones, it may be needed to enter password (0000). Insert card into headset’s card slot. Connect to read card mode by pressing EQ inwards and look for blinking light green indicator. The headphone automatically decodes audio format files that can be played. Turn off the headset before charging. Connect charging cable to the headset and USB adaptor to a charging unit (a USB port on a computer). Successfully connected when red indicator lights up. When indicator light turns off, charging is done. 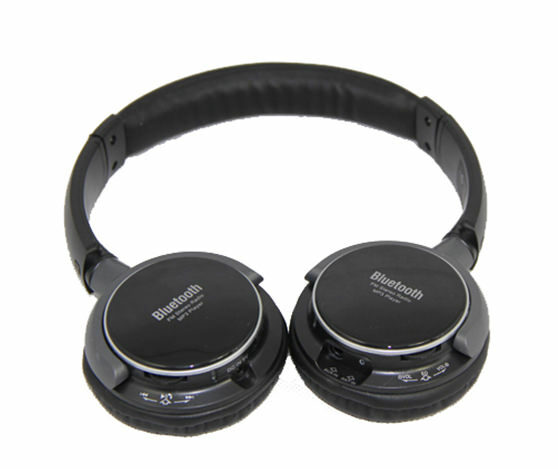 Note: Headset has built-in battery capacity detection system with overload safety protection. Low battery -- Power is low when indicator light blinks green, red and blue alternately. Charge headset as soon as possible. CAUTION：Do not interrupt process of charging the headset’s power; otherwise, the headset hardware and battery life can be damaged.